Maybe the play that won the game? So here i am..drunk after indulging in a huge mix of expensive scotch, beer and true blood shots.. yes true blood shots. I am watching the replays over and over again on sports center still cant believing they won. My pregnant wife is wasted also but wasted in exhaustiveness. It was a loooooong day of prepping and preparing food. And of course yelling and screaming for the giants. There was a whole quarter..especially the 4th where we had the whole Bart Cave yelling DE-FENSE DE-FENSE. It was a great time. This win means a lot to me. 4 years ago my wife and i were married and bought a house. 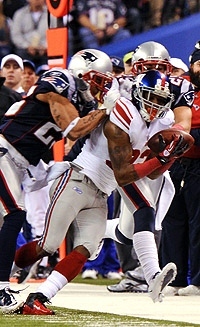 The same year the Giants beat the undefeated Pats in the SuperBowl. Unbelievable. This year we are expecting our first child. Deja-vu. Giants arent supposed to make the playoffs and do. They win every game to make the superbowl and win. Crazy. 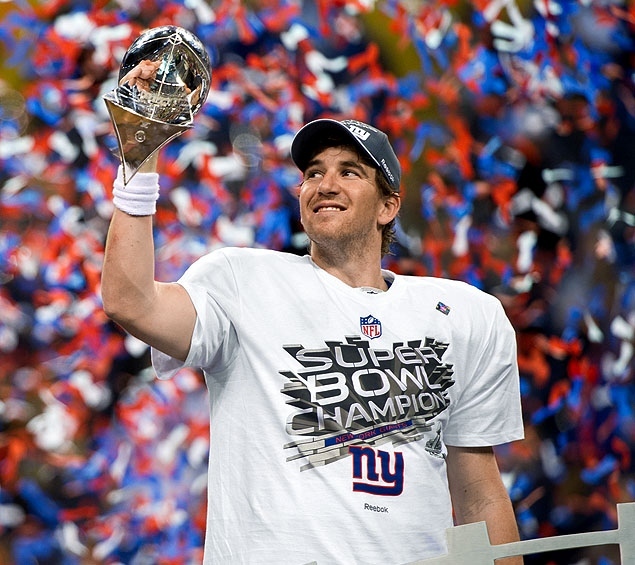 Eli Manning completely won them the superbowl this year. There was a time in the season when nobody expecting them to win anything. 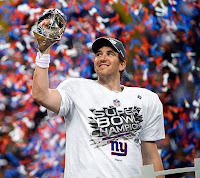 But during these games Eli stepped up and tried and tried and tried and put up tremendous numbers this season. So as much as i would like to bash him with his stupid faces and his stupid comments, Eli was a true performer this year. My hat goes off to him. He was better than Brady this year in my opinion because the team he had to work with was in no where comparison to Bradys team and the Giants won. Congrats!!! im going to sleep! Eli was the 'lil engine that could this year. I know you were drunk, as was I, but they didn't make the Wild card this year, they beat the Cowgirls and won the division. GO GIANTS!! !